One of my favorite things about spring is watching the tops of the asparagus poke up through the soil. Because I know that means that I’m not too far away from eating that asparagus that is poking up through the soil. Grilled asparagus, bacon wrapped asparagus, asparagus with Hollandaise sauce, Steamed Asparagus with Balsamic Vinaigrette, pickled asparagus…the list could go on for days. And while I prefer to eat my asparagus fresh in the spring, it’s nice to have some available for other times of the year. 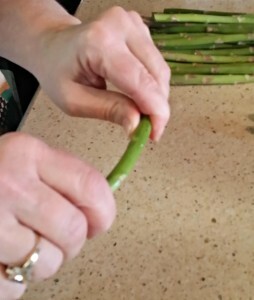 So today, I thought I’d teach you how to pressure can asparagus. 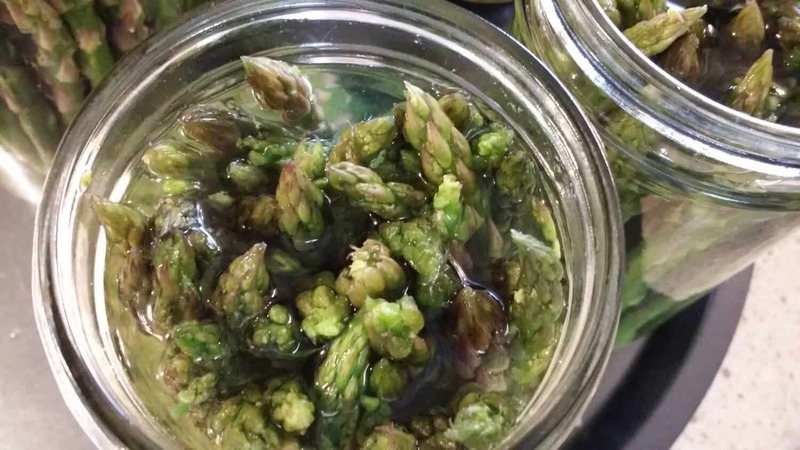 For canning asparagus, you need to have about 2-ish pounds per pint jar. 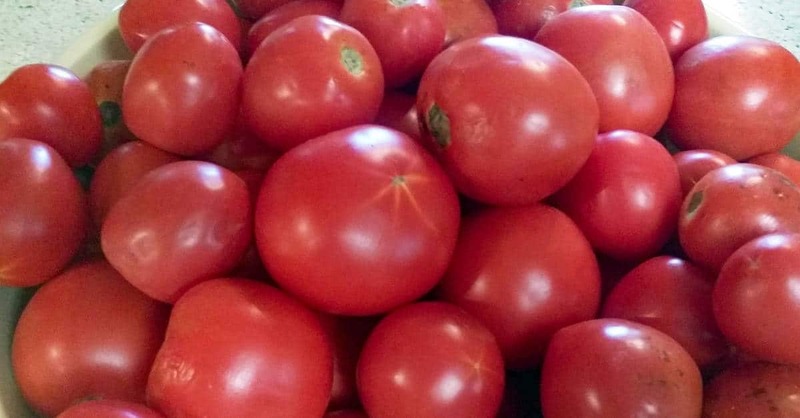 You can either buy it all at once from your local farmers’ market, or you can harvest your own as you get it. Fresh asparagus from your garden will keep for 10-14 days in the fridge if you put it upright in a glass of water. If you get it at the store it will last about 5-7 days. Because we like the tall spears, I use 1 ½ pint jars so I don’t have to cut so much off of the ends. 1 ½ pints are the same size around as the pint jars, they’re just taller. So they use the same amount poundage wise as the pints. 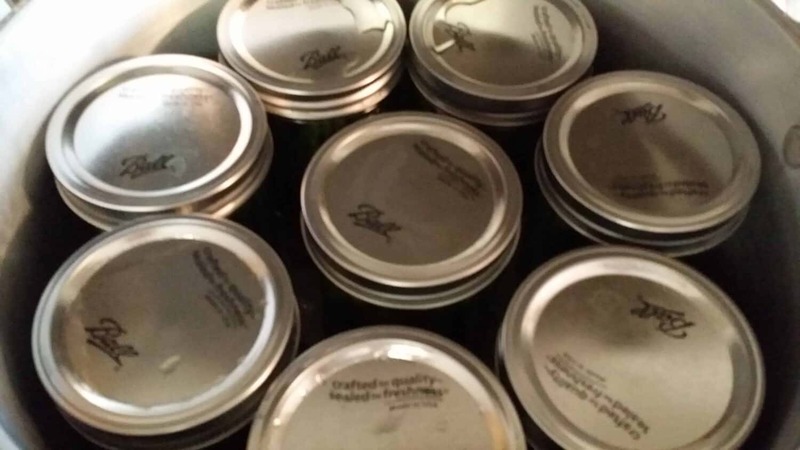 If you are new to canning, or need a refresher, you can learn all about canning here. To prepare the asparagus, wash them in a sink of cold water by swishing them back and forth. Now, bend the spears near the bottom until they snap in two. This separates the “woody” part of the stem from the tender part. Don’t throw those ends out, though. Toss them in the freezer for later. You need to measure the height of the jars you will be using. You need a 1 inch headspace, so your spears need to be an inch shorter than the jars. So put the spears on a cutting board and measure them. Cut the stem off so they are the correct length. You can add those pieces to the ends you snapped off in the step above. Use them later to make Creamy Asparagus Soup. 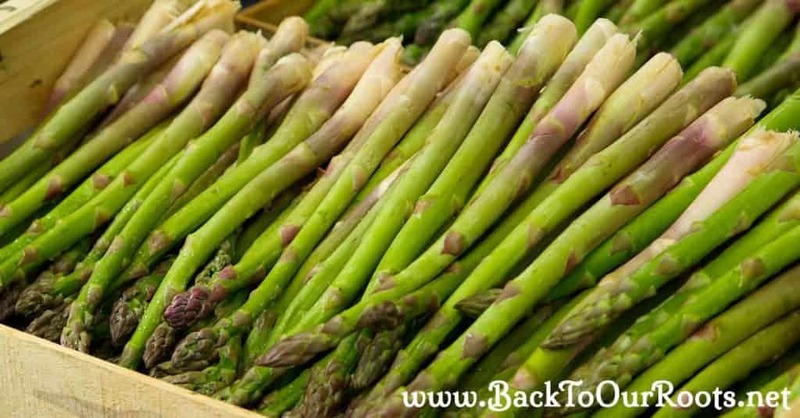 You can raw pack or hot pack your asparagus spears. 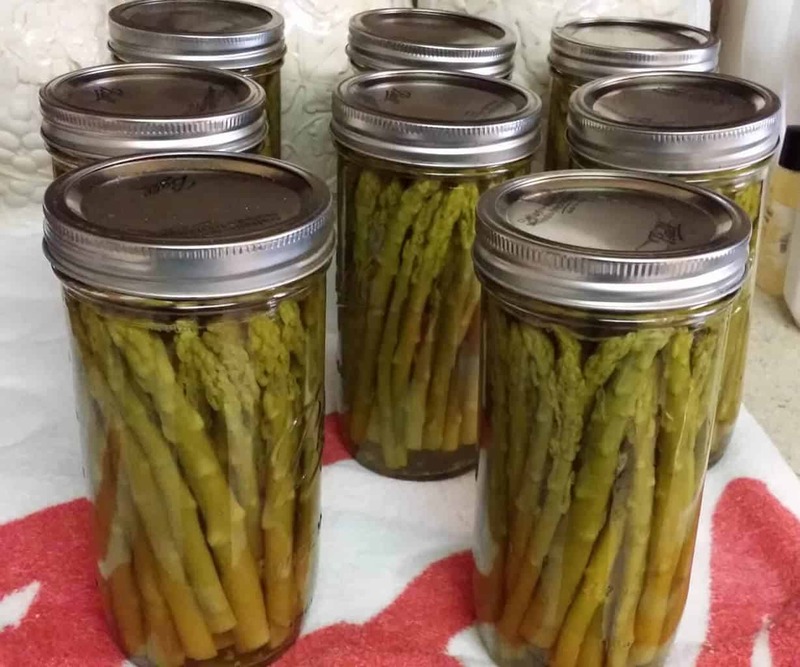 I prefer the raw pack method for canning asparagus. Before you begin, make sure your jars are clean and hot, and your lids are prepared according to the manufacturer’s directions. Pack the spears into the clean, hot jars as tightly as you can. The spears will shrink up dramatically, so really pack ‘em in there. 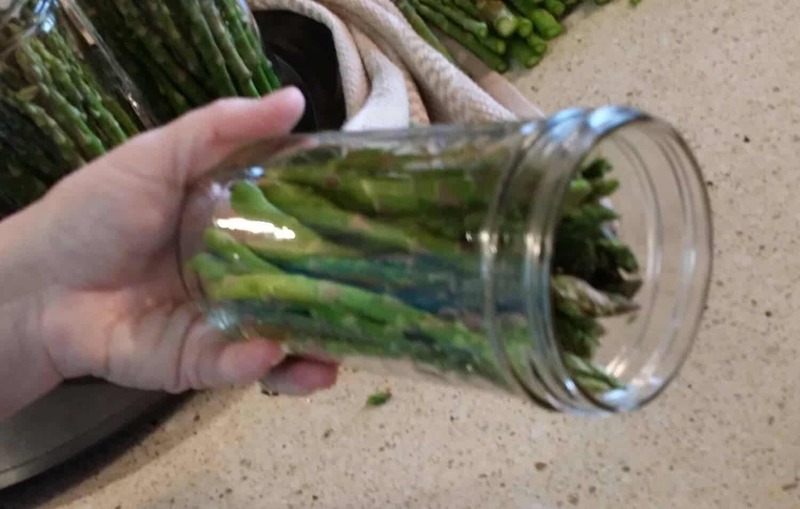 If you are canning asparagus pieces pack them as tightly as you can leaving 1 inch of headspace. Now fill the jar with boiling water, again leaving 1 inch of headspace. Add salt if desired, using ½ tsp for pints and 1 ½ pints, and 1 tsp for quarts. Wipe the rim with a clean, dry cloth. Now seat the lid and put on the ring, tightening just until finger tight. Fill and close the remaining jars. Place the jars in the canner, adding the amount of hot water appropriate for your canner. in the canner they go! Secure the canner lid, turn on the heat, and vent for the amount of time specified for your canner. Place the weight on the vent and bring up to pressure. If you are using a dial gauge canner, process at 11 pounds pressure for 30 minutes for pints; 40 minutes for 1 ½ pints and quarts. If you are using a weighted gauge canner, use the 10 pound weight and process for the same length of time. Don’t forget to adjust for your altitude if necessary. After processing allow the canner to cool down on it’s own. Remove the jars and put them on towels in a draft free location to cool. After a minimum of 12 hours, check the seals, make a cool label with the contents and the date, and put them in your pantry. Now stand back and admire your handiwork! all sealed and ready to go on the shelf! Are these “mushy” like all store-bought canned asparagus? Or does the raw pack method help with this? How long will they stay good after canned and shelved? Hi Christina! 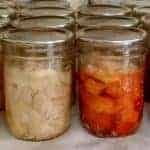 Home canned goods that are properly processed and stored in a dark, dry, cool environment will last for several years as long as the seal is intact. That being said, the quality of the foods begins to deteriorate after about a year(ish), depending on the items canned. With asparagus, they will continue to get softer as they are stored. I would recommend that they been eaten within a year for the best quality. Blessings! I make dilly asparagus every spring and summer. Delicious! It’s a dill pickled asparagus spear. But mine don’t go to mush. I process the same as you only using the usual, salt, garlic, dill. We can it the same, I process mine in the hot bath for only 10 minutes and then get them out of there. I have all of the many canning tools to move the hot stuff around. I’m going to try yours to just plain to have for the holidays. I don’t know why it never occurred to me. Although I seem to be able to get it in Delaware year around. I think I just like being in the kitchen and how beautiful the jars are when they are done. The first time I had asparagus was when I was in the Army, I’m not really a picky eater and am open to trying just about any food as long as it looks interesting, smells good and if it tastes good to me, with only a few things I’ve tried in my 64 years that I don’t like asparagus was one at that point, it tasted nasty and smelt bad, here to find out they cooked it to death and it sat for a long time a big no-no for asparagus, for years I wouldn’t even think of eating asparagus until a friend and I were camping and came across some wild asparagus, he talked me into trying it again but first raw, to my surprise there was a nutty beautiful flavor I had to have more of, we had our dinner that night in the woods made up of wild foraged edibles and I couldn’t get enough even after it was cooked, my friend being a professional chief at the time explained that over cooking turns asparagus into something terrible and I agree that is why I only eat it fresh and why I think I will not try to can it and why I only buy fresh, my wife and I do a lot of canning but I cannot convince her to try asparagus since she had a similar experience and is a very picky eater. I have never seen it growing wild! That’s pretty cool. My favorite way to eat it is actually grilled, but still crisp. 🙂 But I totally understand not liking it canned. Thanks for your comment! How do you cook it after it’s canned? Sarah, I put it in a small saucepan with the liquid from the jar and just heat it up. 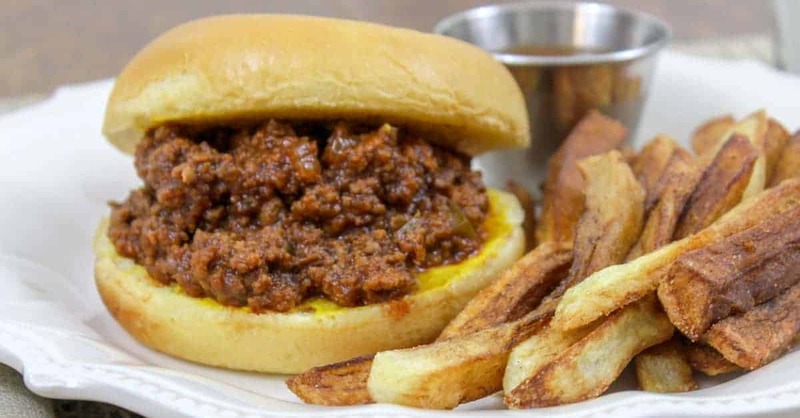 It’s already been cooked through the canning process, so heating is all that’s necessary. 🙂 Thanks for stopping by! I read that you should take off the bands of the canning jar and just leave the tops where sealed. Is that correct information? I personally store mine with the rings on. I usually can around 1500 jars of food a year and in my current home I absolutely don’t have anywhere to store all those rings! I do make sure that the rings are loose on the jars. Tight enough to not come off when I pick up a jar, but not tight enough to be a problem if the seal gets broken. Since I have to store a lot of my jars back in the boxes and stacked on each other, I feel like the rings are actually protecting my seals. However, if I were storing the jars somewhere damp, the rings would probably rust which makes it difficult to remove from the jars. And if that were the case, I would figure out somewhere to store the rings separately. I just pressure canned my first asparagus. When I took the jars out, I found a lot of the water in the jars had evaporated! 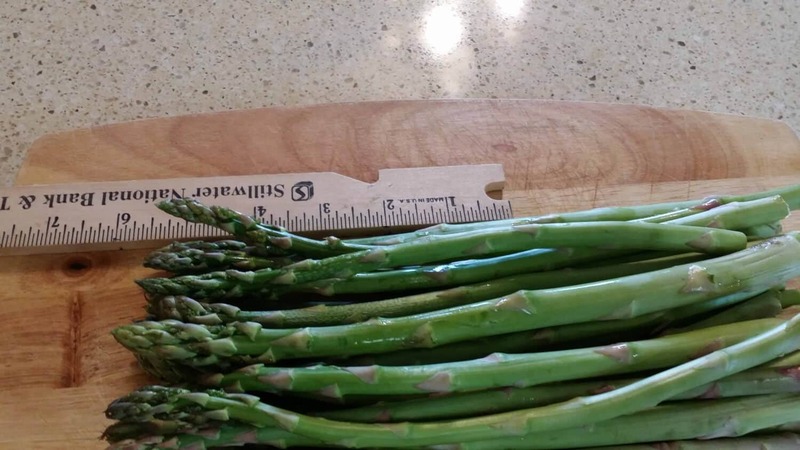 The tops of the asparagus aren’t covered in any water! What did I do work. They were pint jars. Having less water in the jars is not uncommon and it’s not a problem. Everything inside the jar is sterile after processing, so it’s perfectly safe. There might be a slight discoloration after a while where the spears poke out of the water, but if you keep it somewhere dark that probably won’t happen. 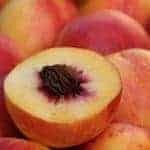 The water loss can be caused by a few different things, so here are my thoughts. 1. If you put a little more water than the recipe says, the water can boil out during processing. Because the level is higher, it’s closer to the lid and can escape. 2. If there are air bubbles in the jar, the bubbles will pop during processing and your water level will be lower. and, 3. If the jars aren’t lifted straight up out of the canner the water can leak out. The lids often don’t seal while the jars are still in the canner, and lifting at an angle can cause some water loss. So those are things you can check next time you can. But as I said, the contents are perfectly safe to eat. Blessings! I love pickled asparagus. My recipe calls for blanching it for 4 minutes, then packing in jars and covering it with a vinegar / water / salt / garlic / spice brine. It then goes in the fridge for 3 days before it’s ready to eat — CRISP & YUMMY. I was hoping to find a recipe here to pressure can it for long-term storage, but from what I’ve read, that would probably make it mushy. We keep it refrigerated up to several weeks (if it lasts that long), lol. Hello Thomas! You are right, pressure canning it will probably make it mushy. However, with the vinegar in it you might be able to waterbath can it. You can always process one jar in the pressure canner and see what it’s like, though! Sounds like a great pickle recipe! Pressure canning some now. It is supposed to be helpful to bring blood pressure down but I don’t want nasty cans of teh stuff. Glass jars are best. Making pints but might try 1 1/2 pints next time.